Yesterday I saw the most impressive 3D video I've ever seen in my life. I wasn't in an IMAX theater. I wasn't watching Gravity. And fortunately, I wasn't eating popcorn. At an event Thursday night, Sony hosted a small selection of the press at its New York headquarters ostensibly to unveil a new 27-inch high definition medical monitor. While the monitor is big news for Sony and the medical community—it's incredibly slim, flawlessly designed, and is the brightest surgical monitor ever released—the event was about much more than that. Sony took us on a journey through its extensive suite of healthcare offerings, including cameras, recorders, and printers, and did a great job of illustrating how deeply embedded these products are in all areas of the medical industry. The highlight of the event, however, wasn't a product. 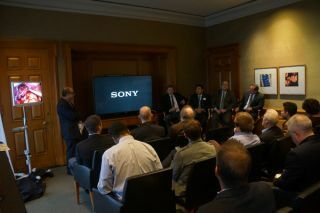 Sony hosted a panel of four nationally recognized physicians, Richard Mackool, MD, Dennis Fowler, MD, Steve Palter, MD, and Daniel Eun, MD. (These guys are all MDs, btw.) Each took turns describing in depth the incredible difference that advancements in AV have made to their practices, professions, and students. These testimonials were eye-opening to say the least. All of them couldn't say enough about the huge role AV and Sony have played in advancing medicine, especially surgery. And this is where the 3D video came in. One of the greatest advancements, they all attested, was the ability to watch live surgery, and show students and fellow doctors video of medical procedures, in 3D. For example, Dr. Mackool, assistant director of the Mackool Eye Institute and Laser Center, showed a video of a cataract operation in 3D. The precision necessary to perform this standard operation—we're talking down to the millimeter—is almost impossible to convey in two dimensions. Of course, such operations were done well before 3D video existed, but with 3D technology, he was convinced he could teach his grade school age kids how to perform cataract surgery in a matter of weeks. The same went for Dr. Eun, associate professor of urology and director of minimally invasive robotic urologic oncology and reconstructive surgery at Temple University School of Medicine. He showed 3D video of a kidney tumor operation, which, hands down, was the craziest 3D I've ever seen. It was unbelievable, and I can only imagine a completely indispensable learning tool. Sony has been on the front lines with these doctors, often working hand in hand to bring the highest resolutions and most advanced AV into operating rooms and medical schools. The endorsements given by these doctors were very compelling, and spoke to the ambitious ways in which Sony is pushing the envelope in this field.